I was probably the last person on earth to find out about the magic that is zoodles. I’m such a late adopter that my computer is still auto-correcting zoodles to noodles every chance it gets, which is kind of funny because once you have a plate of zoodles you realize that while you still love noodles, zoodles are the next best thing. And sometimes even a better thing, if they are topped with a pile of tender, lemony shrimp. So whether you are a zoodling pro or a zoodling newbie like me, you will still love this lemon shrimp recipe. And now my computer is autocorrecting zoodling to “doodling” which is JUST NOT RIGHT. We are going to be doing a fair amount of zoodling around my house over the next few weeks, because the Southern husband and I have jumped back on to the Whole 30 to get into good fighting shape for the holidays. Yep, I just said holidays. They are coming. 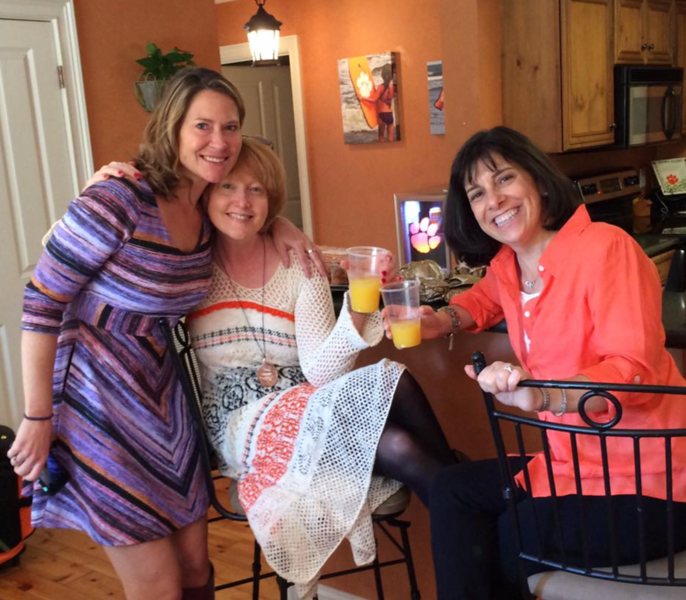 And in preparation for the Whole 30 (and click here to read more about what that is), I went in the exact opposite direction this past weekend. 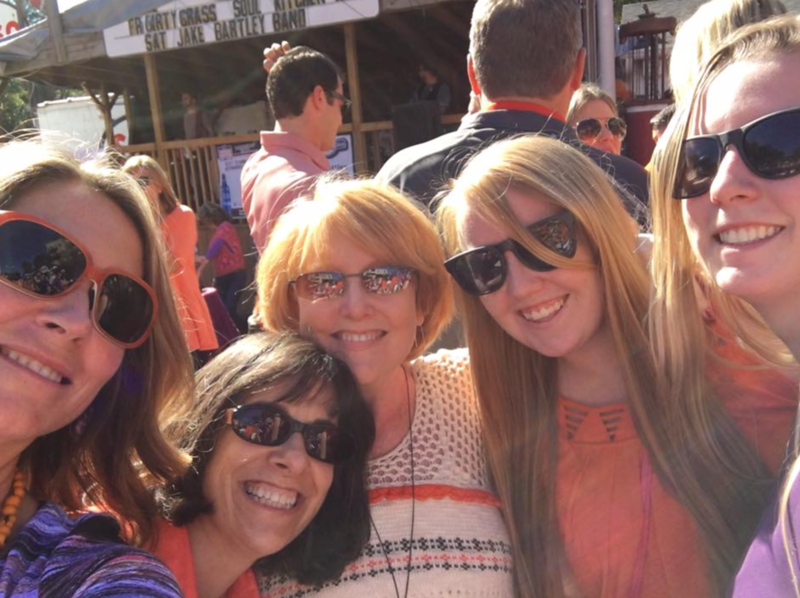 Unless you count the grits I had at the Smokin Pig, there was not a vegetable in sight…which was fine with me because we were down in Clemson, South Carolina for some football with friends and family, and to spend some quality time with my Clemson tiger cub…. 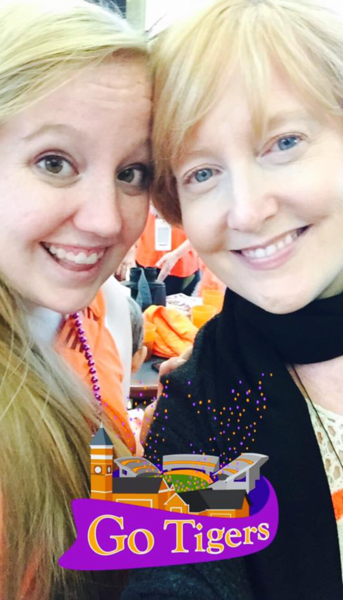 …who is now a Clemson alumni with her own apartment and job and all that, but she will always be a cub to me. We started off the day by having a little something healthy to drink. Orange juice! Cough-cough. Mostly. Good and good for you. 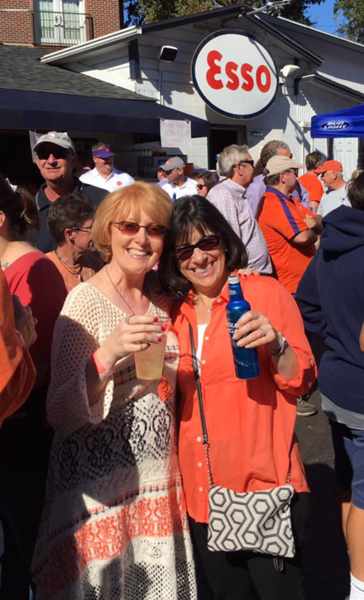 Then later in the day during the tailgate, we made our way to the Esso Club. Smiles brought to you by best of friends-dom and whatever that is in our hands. Mine has ice in it. Hydration is very important. All my Tiger Girls were with me. I think there were some guys there too, but they seemed very centered on watching the other games on the big screens while we were waiting to head to the stadium. Boys. Ridiculous. Anyway, now that I had thoroughly cleansed my system of anything that didn’t involve cheese or fried food or a Solo cup, I was ready for the kick-off of our next Whole 30, which brings me back to my original point about zoodling. To zoodle, you need a zoodler, which basically works like a big pencil sharpener for squash or cucumbers or anything else along those lines that you want to zoodle. 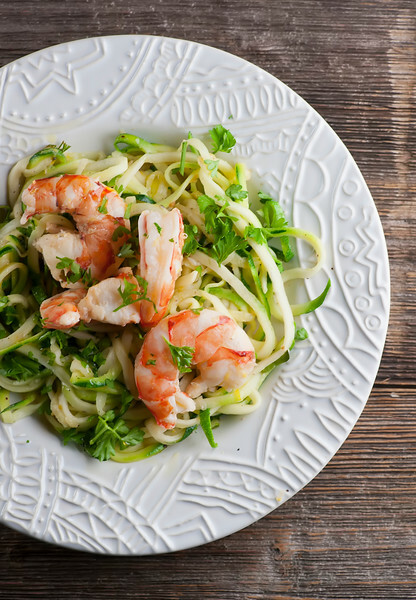 Give it a twist, and zoodles come out the other end – the perfect shape for quickly sautéing in a little olive oil and then serving with delicious things piled on top. Like lemon shrimp. Almost as delicious as good times with good friends and family. Almost. Cut or zoodle the squash into pasta sized strips. Heat the olive oil in a large skillet over medium high heat. Saute the garlic, lemon juice and shrimp until the shrimp are just tender, about 3-4 minutes. Remove shrimp and cover to keep warm. Add zucchini noodles to the skillet and cook, tossing with tongs, until just tender, about 1-2 minutes. Season to taste with salt and pepper. Divide zucchini noodles onto plates. Top with shrimp and drizzle with any drippings you have from the pan. Garnish with lemon zest, parsley and a little ground pepper and serve! I’ve never actually made my own zoodles before, but I have devoured massive amounts of them. This sounds like the perfect meal to get in shape for the holidays with, Kate! I love the flavor on the shrimp! 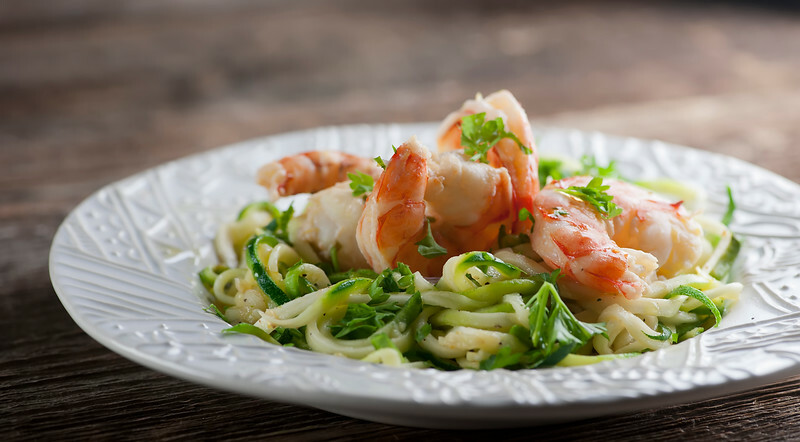 I love zoodles and serving them with lemony shrimp sounds so light and delicious! Thanks for sharing this recipe! Noodles are so much fun, right?